So much of the allure of wine is the aspirational component of it. Not in the financial sense, of course: I personally have a problem with anyone who buys wine for the so-called trophy factor, displaying it with care and attention to its angle and lighting and the perfection of its label...and then never drinks it, holding onto juice that was crafted with care and love for the one purpose that these hoarders eschew: Consumption. No, what I’m talking about is the aspiration that almost all wine lovers share: To experience a great bottle. And just like music lovers covet the chance to see a favorite reclusive performer in concert--ever talk to anyone electrified by the experience of having seen Sly Stone or Glenn Gould live?--so, too, do devotees of the grape live for those all-too-rare days when corks are popped on the bottles they’ve only read about. With this in mind, check out this link to the Quarterly Review of Wines. In their words, they “turned to some of [their] experts to inquire about their choices for the top ten wines they have tasted from the 20th-century.” Its as aspirational a list as you’ll find, and composed of wines that many of us may never have the chance to experience. But it’s a fascinating listing nonetheless, and implicitly asks this question: Which wines in your personal collection will rank among the greats either of all time or, more importantly, your personal favorites? It’s all about aspiration, no matter how big or small your personal wine budget may be. Interesting link, Brian. We've had occasion to taste some of those producers, but none of those particular vintages! Hopefully a few the modern day vintages will become legend in their own time. But can I take issue with the premise of your opening? If I don't, my entire career in business marketing is invalidated! (Hey maybe that's a good thing). 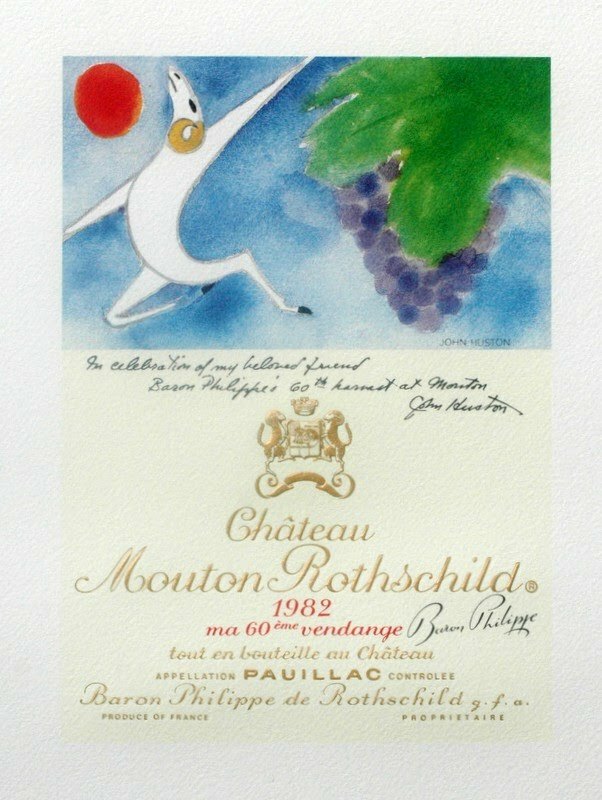 If wine was just for the "one purpose of consumption", then would Mouton put so much effort into that artist's label above for collection and display? Would Lafite etch a Chinese number 8 onto the bottle, and watch the value soar? If it were just for consumption would fine wine be priced at $300, $500, $1000 a bottle? (Never mind Cognac sold in Baccarat cut crystal for $10k+). While it will get consumed one day, don't mistake the idea that today's PRODUCERS of a $1000 bottle of wine have it primarily for consumption any more than Ferrari is for commuting. And all of those wines listed are now well into the Ferrari price level, worthy of display for the rarity and value they possess. In fact, the reason some fine wines sell for what they do is because the offer something more than mere consumption. The 2008 Lafites are now worth 10x more to the Chinese than they are to me. It's a $2000 bottle in Hong Kong! The businessman who can give the gift of Lafite in China honors his guests, and also demonstrates his own power (or his prescience if he bought them at $200). Perhaps the recipient needs to see such a display to forge the relationship. And the relationship might be worth millions. Who knows, but if it was because of the wine rather than the label, then Lafite wouldn't be priced to the moon. That would be a good experiment... go to China, plonk down a bottle of Yellow Tail and say, "Let's make a deal!" Don't begrudge the aspirational collector who displays wines any more than the collector who displays art, watches, guns, books, big game, or whatever they're into. They'll get round to opening it at some point. But meanwhile, if it is rare and precious and special to them, why not? And I know you Brian Freedman, you old softie! I saw the look on your face and heard the catch in your voice when you stepped into the vineyards at Cheval Blanc for the first time, a look only recently eclipsed by the priceless look on your face holding your new baby, lol. The pic of you walking in the Yquem vineyards is your FB profile pic. Why not display one from Chaddsford, your local?